With Education Secretary Betsy DeVos, it might be tempting to see Arne Duncan as an educational expert, but Duncan has never formally studied education, or been a teacher. Duncan paved the way for DeVos. EdSurge recently brought us Arne Duncan’s 6 lessons about education. They are nothing but the same old corporate reforms that have destroyed public schools and the futures of children for years. Here are his claims and my anti-arguments. He emphasizes early childhood education and the economy. While there’s a school-to-work connection, especially with older students in high school, teaching young children should be about their development, not promoting the economy. Too often this message results in pushing young children to work at a higher level than they’re capable. The report of which Duncan refers is by James J. Heckman, a professor of economics at the University of Chicago. It highlights the economy and the nation’s workforce. Here are the subheadings of the article. Investing in early childhood education is a cost-effective strategy for promoting economic growth. His thoughts about equity are misleading. Duncan argues that poor children need something different than what wealthy students find in their schools. But poor children deserve well-run schools, with resources and qualified teachers, not strict charter schools run by management companies and novices. Most charter schools care more about their bottom line. Feeding poor children and health screenings should be a part of every school plan. If Duncan cared so much about grief and trauma in children, why didn’t we see an increase in counselors, school nurses, and school psychologists under his watch? He claims class sizes don’t matter. This has been the refrain by reformers like Bill Gates for years and it is false. Here’s the STAR study as one example in favor of lowering class size. Lowering class sizes would help teachers have better overall classroom management. Students would be safer, and children would get a better grasp of reading and other subjects in the early years. He says teachers matter more than class size. Real teacher qualifications matter. But that’s not what Duncan is talking about. He is promoting the faulty idea that a “good” teacher can manage huge class sizes. Of course, this makes no sense. This is also connected in a roundabout way to replacing teachers with technology. Imagine one teacher teaching thousands online. Duncan has always been on the side of Teach for America fast-track trained teachers. Consider that they will likely become charter school facilitators, babysitters, when students face screens for their schooling. He uses teachers as the fix for poverty. This is an old and dangerous refrain. This message drove No Child Left Behind and Race to the Top. It made standardized testing and one-size-fits all common practice. Teachers can help students, but economic forces are greater than anything a child can learn at school. Blaming teachers for the problems in the economy, has always been about getting the public to take their eyes off the real culprit of economic woes, the greed of those who run corporations! He claims children will create their own jobs. This is an unsettling thought, but it is driven by many charters and the maker movement. It’s the idea that students will pull knowledge out of the air and direct their own paths without much help from teachers or public schools. The reality is that industry and corporations will direct students, moving them early into career paths that benefit the corporation. He uses flowery language to confuse. He says: Content knowledge will always be important. But more than ever, the habits of the mind will be deeply important for this next generation of leaders. Habits of the mind? Content knowledge is important. Period. Students must study a subject to learn about it. They cannot only play with tinker toys without mastering the information surrounding the projects they work on. He also says: They [children] will need the ability to think critically, to synthesize information, and will need to have an eagerness to embrace problems. Teachers are necessary to help students with this. They have always worked on this. He mentions joy of learning, and students should not focus on tests. When Duncan was education secretary, and when he led Chicago schools, how many public schools closed due to the enforcement of standardized testing? Duncan criticizes testing now because he is paving the way for nonstop online assessment and data collection. That’s what personalized learning is all about! It has nothing to do with the joy of learning. He says we don’t need to worry about technology replacing teachers. Duncan tries to act reassuring about technology not replacing teachers, because he knows a lot of parents and teachers are worried about it. But blended learning is often more tech than teacher, and online charters and programs like Summit are popping up everywhere. I received an email the other day from a parent worried about this conversion. Duncan has a lot of personal ties to tech too. He claims we should collaborate with other countries on education. He tries to convince us that as education secretary he looked at how schools in other countries do education, and that we must all work together. Can we name one innovation that Duncan implemented from another country here in the U.S? We knew for years that Finland had a good school system and treated their professional teachers with the respect they deserved. Perhaps Duncan now wants to promote his ideas of corporate reform around the world. He claims we need honesty and transparency. We need this with charter schools, and when there are partnerships with built-in agendas to transform schools. 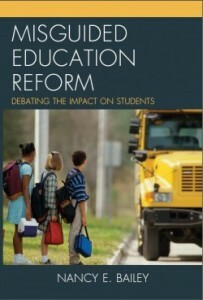 To summarize, Duncan is doing nothing but promoting a continuation of the corporate school reforms he pushed years ago. He knows little about how students learn, and he is no friend to America’s students and their public schools. Duncan was not an educator. DeVos is worse as an educator. These two together were useless. Education is sadly being chopped up for profit schools, charters and private religious schools. 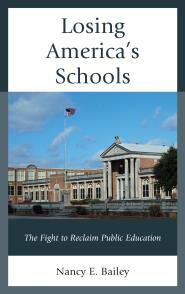 We need a strong public education system for all publicly educated children. One transparent public school only. Religious schools are not taxed why should we pay for any of these. We need representatives that support public education only. We have poverty NOT because we can’t afford to feed/clothe/educate the poor, but because we cannot satisfy the rich. Arne is a “wanna be”. Sure he has a lot of money, but he will NEVER be able to keep up with folks like Gates and the Waltons. Arne will never be satisfied, therefore he will never look any further than the next scam that he thinks will raise his social status (and bank accounts) to that of his “idols”. I do believe Duncan gets his marching orders from Gates. Thanks, Lisa! Arne is right. Poor kids do need something that rich kids do not need. They need complete safety in their environment. They need family stability. They need to develop a love for learning. They need their mothers and fathers to share in the delight of taking them to the ballet and the symphony. They need to feel the delight of working alongside their mothers and fathers in jobs that benefit the family and society. In short, they need a place in society. And so much more. Exactly how Arnie can claim his ideas lead to any of the above needs defies imagination. Yes. I agree. Thanks for adding to the conversation, Roy! Why is it that they always seem to appoint heads in this area who have no experience in it? It’s this “those who can’t, teach” attitude, I’m guessing. Any idiot can do this cushy job! This attitude of “it’s not the class size, it’s the teacher” almost invariably comes from people who attended private schools which had small classes and they think it only applies to the state system – private schools brag about their small class sizes. There are, admittedly, the “I was in a class of fifty and it never did ME any harm!” brigade, but I bet they would have a fit if their own children were in classes of fifty. Teach For America is stupid and the worst of it is that it has wandered over to Australia, where every year we read at least a few articles about people who have taken it up and dropped out when teaching turned out not to be the cushy job with lots of holiday time they were expecting. Last year I read the whining of a young Teach For Australia graduate who barely lasted a term and complained that she no longer had time to go to the gym, poor dear! Teach for Australia! I guess I knew this but it’s difficult to read. Thanks for giving us the rundown on what’s happening in Australia, Sue. And I like your blog and book reviews a lot! I will add on my wobbly website under Reading and Australia. Let me know if you have favorite Australian websites that would help us with our schools or language arts and reading. Working on my website is one of my New Year’s goals. “It’s not the class size, it’s the teacher” This is the pitch for computer delivery of instruction, with Kahn Academy massively open (and failed) classes for high school, and from preschool on, teacher aides supervising lessons. It is also the pitch for Arne’s new ventures with the tech experts many with zip experience in teaching, just like him. We have had really poor federal leadership in the Department of Education and in federal legislation. The requirements in ESSA are as stupid as in NCLB. They reflect the stickiness of bad ideas circulating among the lobbyists in DC and the well-planned campaign to place TFAers in key legislative staff positions. IN any case, thanks for the direct and well-informed counters to the nonsense that Duncan tries to sell…all too successfully.